Olivier Humbrecht is without doubt one of the world's most skilful winemakers, and for me, his ability to combine the natural, fruity character of aromatically perfect grape material with a high complexity is unique. To some extent, this is about balancing the reductive and oxidative processes from "débourbage" until the wine is poured into the wine glass, an art Olivier masters to perfection. 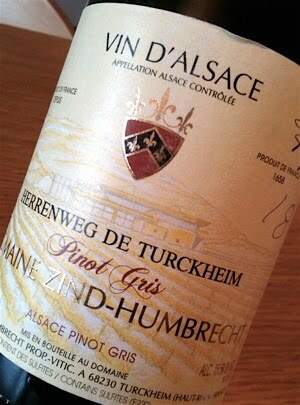 2007 Pinot Gris Herrenweg has a yellow straw color, a great scent with a lot of honey, clementines, toffee, raisins, nectarines, nuts and a touch of mushroom. The taste is powerful, almost hard, with a distinct sweetness (20 g/liter) that is overwhelmed by splendid acids and a sensation of minerality in the finish. Price: € 28.